I couldn’t believe summer vacation was over and we were starting the first day back to school. I created a Psalm 1 Tracer for Jordan when he was in first grade. Parker listened to his Sing the Word Bible verse and completed his tracer. The following day he added it to his Bible lapbook. This year we’re learning about all those who need to hear about Jesus using the THUMB acronym (Tribal, Hindu, Unreached/Unchurched, Muslim, and Buddhist). The boys traced their hands. They added letter stickers to the top and wrote in the rest. We read about the first settlers and how they developed various crafts. I set out a cardboard loom activity as suggested in our Usborne Book of World History. Both Haley and Jordan were excited about this activity. It took a while to weave, so we started it and set it aside to work on later. Both our FIAR (The Giraffe That Walked to Paris) and Sonlight History lessons were about Egypt this week. We LOVE when that happens! I set out our Egypt packet from Little Passports. The kids were SUPER excited to use the excavation kit! Jordan and I read Let’s Explore Egypt on our Epic app. We took our excavation kit outside and the little archeologists got RIGHT to work! We did quite a bit of phonics this week. Since we’ve been learning about animals in science, I printed a copy of our Katy No Pocket Phonics Worksheet. Parker matched all the letters to the pictures with the same starting sounds. We reviewed our vowels and consonants during our grammar lesson. Parker marked all the vowels on our Strawberry Alphabet file folder game after reading our Mother Goose poem. This year Parker is using his own readers alongside the I Can Read Word List. 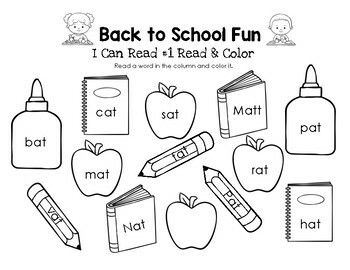 I created a Read and Color worksheet to go with lesson #1. Parker found and colored each word while I read from the word list. I was SUPER excited to start reading Charlotte’s Web again this year! We brought out our little farm set to use during our read-aloud time. Parker loved playing with the set while I read. We slowly added to our farm animals as we read about each character in Charlotte’s Web. I created a Math on the Farm – Roman Numeral Match to go with Charlotte’s Web. Parker did a great job matching the Roman numerals! Since we were reading Charlotte’s Web, we decided to go on a bug hunt in our backyard. Haley instructed the boys to remain still, because the butterflies would come if we did! She is a girl after my own heart! Both boys are learning about animals so we embraced the wild kingdom with a zoo-themed day! After breakfast, I pulled out some of our zoo file folders. The boys worked on those while I read about the zoo. Parker worked more on his starting sounds. We read about animal legs, teeth, bottoms, and feet! The boys walked on all fours like many of the animals we read about. Afterwards, the kids worked on creating new animals with their Create-a-Creature worksheets. Here’s a FREE copy of the Create-A-Creature worksheet I put together! The kids LOVED this activity! Parker even used his creatures as the subject for his creative writing assignment. This was a fun week and we’re looking forward to week #2!